Hello, world, Happy April Fool’s Day, and welcome to the Magical, Motivational, Monday Edition of The Good News Journal, thank You kindly for being here. Everything in the Universe is Magic. I had said only recently that I might change the Title from Motivational Monday to Magical Monday but I am thing King that knowing the Universe is Magical is Motivating, so for All Fools Day to fall on Magical Monday was not a coincidence, but an example of Magic. Everything We celebrate is related to Magic in some Way, as the Act of celebration is a Form of Magic, too. Today, I’m going to see what Google has to say about the origin of April Fools Day, and compare it with the Fool of the Thoth deck. So I just Googled ‘April Fool’s day origin‘. The first Link, claims the true origins of the day are unknown, but offers several possibilities. The first, and the one I personally find most compelling, is switching from the Julien calendar to the Gregorian Calendar. By the Julien calendar, the last week of March was a celebration of the New Year on April 1st, and those that were late to get the news and still celebrating the New Year on April 1st were called April Fools. The reason I find it the most compelling theory, is because I had a feeling April Fools day would have huge Magical Significance, but I’m learning this for the first time, too. I’ve known about the switch to the Gregorian calendar, but I had no Idea what the previous calendar was called, or the theory relating to April Fools. I also know it is reasonably safe to say that the Gregorian calendar was probably the second to most (and perhaps even arguably the most) Powerful Magical Spell ever Cast on Man’s Kind. The other contender would be the Bible, and the Two Spells Work in Harmony with one another. (Reminder, II is a Door in Magic). The ‘Word’ of the Bible has been spread virtually all over the world, almost everyone knows the Story in varying Degrees. Consider that Mind is the Creative Force, and that collective conscience is that much more Powerful than individual conscience. If the Mind is Creative (and it is), how much more Powerful is it to have the whole world thing King about One Story? The ‘Self fulfilling prophecy’ becomes a ‘We fulfilling Prophecy’. Now let’s take the Magic One step further. Let’s make the Life of the Story’s Hero, the timeline of Man’s Life. We’ll call it the Gregorian calendar, and everyone who uses it Will be acknowledging the birth of the Story’s Hero. Genius. Everyone who believes it’s 2019, is now a Character in the Story. And everyone also has a vague Idea about how that Story should End. None of it is a coincidence, Ladies and Lords; coincidences don’t exist, only the illusion of coincidence. The People who set this all up knew what they were doing, they are Masters of Magic. And Trust Me, their Intention is Good. Seriously, who has the Power to change Time, the calendar of the entire planet? I know other calendars are still used, but I am also thing King it is reasonably safe to say the Gregorian calendar is the most Common calendar in the world today, making virtually everyone a Character in that Story. The Idea that all the world is a Stage is not a joke. The article from History Channel dates the event taking place in 1582, which really isn’t that long ago. The People running the Show back then, are the same People running the Show now. Now let’s take a look at The Fool from the Tarot and Crowley’s Thoth deck. So much going on in that Card, it’s pretty hard to know where to start. Let’s take a look at what the Book of Thoth has to say about it. It’s also not a bad place to start if any One is Truly interested in learning more about real world Magic. The other detail I noticed is that the main Significant Matter of Importance regarding the Card, is that its number should be ‘0’, the Nothing from which everything Springs. With the return of the Sun, Life Springs forth. Green represents Love and Life (first Forms of Life on Earth were Green). In Shakespeare’s Plays, the Fool was often right in the End. It may not actually be the beginning of the year, but it is the beginning of Life returning to the Earth in the Northern Hemisphere. This is why understanding there are no coincidences is so important. 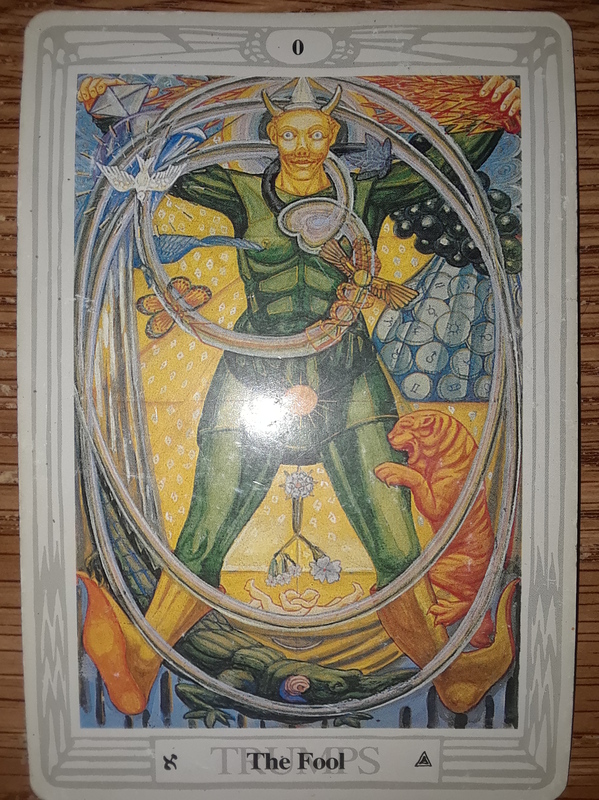 It seemed appropriate that I should introduce The Fool from the Tarot on April Fools day, and it just ‘happens’ to have something to do with the ‘Spring Festival’, which was once the beginning of the year. We were Magically Cast into a new timeline Called the Gregorian calendar on April Fool’s day, and became Characters in a Story Called the Bible. The Characters of a Story are the intellectual property of the Author, so technically, everyone also became possessed by the Vatican. How’s that for some Black’s Magic? Maybe that’s one of the reasons it’s also known as ‘All Fools Day’, because let’s face it, if You as the next person You meet what year it is, after as King of You if You are feeling okay, they Will likely say, ‘2019’. But I am also thing King that most of Us know the world is more than 2019 years old – considerably more. Would One believe Man can transform Time and Space? How about Time, Space, Body, Mind, and Spirit? Five incredible Spells to possess all of Man. Deep and Powerful Spells have been Cast upon Man. As sinister as it might sound, I Promise You, there is a Divine Intention behind it all. The ‘objective’ of the Tarot, is to help One find the Path, much like the Oracle in the Matrix. The Goal is the same for everyone, to know One’s Position on the world Stage, and to Play One’s Part in the Great Work. The Great Work, is the Golden Dawn, and the Golden Dawn, is the New Earth that is Coming now. Things are finally heating up, Dames and Sirs! There is still snow on the ground here in Canada, and it was kind of cold today, but the Sun is Coming, Spring has Sprung. Happy All Fools Day, everyone! I want to add that as Abraham Hicks says that we are an extension of God or source energy . It is well known to all , that as an extension of God or source energy , we have timeless , spaceless , formless and spiritual or metaphysical energetic dimensions that are in other terms beyond the labels or definitions of time , space , matter , and beyond the physical forms and beyond our thoughts and even emotions . This is our oneness of pure divine formless infinite indefinite pure consciousness . Of pure divine consciousness in the drop .